Hi-Tech Electric has been successfully designing, modeling, coordinating, prefabricating and constructing in the 3-Dimension world for over 5 years. Over this time, we have become early adopters of new technology and developing the people and methods needed for successful BIM implementation. 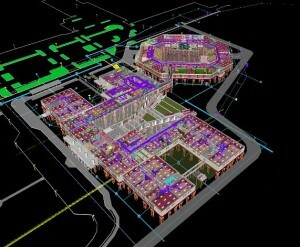 Our team consists of full time BIM modelers and detailers and are active members in the BIM community. Our staff is trained routinely in the latest software applications needed to meet both company and customer project objectives. Being seamlessly integrated with our prefabrication departments allows model information to move electronically from the model to prefab before being shipped to the field. Element depths and layout only. Supplementary components added to the model required for fabrication and field installation.